Roofing FAQs | Whonnock Roofing and Gutters Ltd.
Are their staff trained and Red Seal ticketed? Can they provide a “letter of clearance” from WorkSafeBC and a “certificate of insurance” from a Canadian-based insurance company? Do they have a business licence to work in your town? Will they give you references? Do they have a satisfactory record with the Better Business Bureau in your community? Are they willing to put all agreements, promises and understandings in writing? Will any original materials or components such as flashing will be re-used? Will they give you a sample of the written warranty for labour and materials that they intend to supply? Will they include the procedure for making a claim in the future. Is the roofing warranty pro-rated or transferable? I want to make sure that I’ve hired a certified roofer. What kind of proof can I ask for or be provided? I’ve received several quotes for my roof and some vary in price by quite a bit. Why would that be? Make sure that you provided each company doing an estimate with the same specifications. A low price can signal shortcomings in the reliability of the roofing company and experience of the estimator and actual crew. Make sure that each company is using top of the line materials that also provide extended warranties. Also be sure that the companies with the lowest pricing carry proper liability insurance as you could be on the hook, in the event that something goes awry. Lastly, be sure that there is someone from the crew that is ticketed and get them to provide proof. Getting a new roof is a costly endeavour and you want to be sure it is done properly. An ice dam is a ridge of ice that forms at the edge of the roof and prevents melting snow from draining off the roof. The melted snow then backs up behind the dam and can cause leaks, damage to shingles and other components, and premature roof failure. Ice damming is generally the result of inadequate ventilation, poor drainage (aged, blocked or incorrectly sloped eavestroughs), or a deficient install. While in some cases ice damming cannot be eliminated permanently, there are steps that can be taken to minimize the damming and ensure that even if ice dams are present, they do not penetrate into the home and cause interior damage. Although we live in a fairly mild climate here in Maple Ridge and the surrounding area, these issues can arise in those colder winter months. A great way to counter ice damming is by installing an ice and water membrane to all of you eaves, valleys and protrusions before the shingles are installed. Ask us today about our ice and water membrane called Weatherlock G. It’s a great product from Owen’s Corning, the original inventors of the fibreglass laminate roof system. How long does it take to replace the average roof? The average roof, whether it be in Maple Ridge, Port Coquitlam, Coquitlam or even on the other side of the water in Langley usually takes a day to do. We have 3 full roofing crews and always make sure that there is an adequate work force that show up to do your reroof, depending on its size. We also believe that it is crucial to get a roof done in a proper time frame as taking days to get a job done can be risky business in the rainy environment we all live in here in the Lower Mainland. Yes we do. We currently carry a policy with 5 million dollars. This also includes open flame insurance for commercial grade torchon on flat roofing. We provide a copy of our policy, along with our policy number, in the folder of each quote we provide. That way, you as the homeowner have peace of mind knowing that you are fully covered, in every way, in the off chance that something goes awry. What are the signs that my roof needs replacing? The biggest signs to look for are leaks, missing or torn shingles, loose flashings, excessive shingle granules in gutters, and ceiling spots can signal roof problems. Age is another indicator; if your roof is 20 years old, it could be at the end of its lifespan. 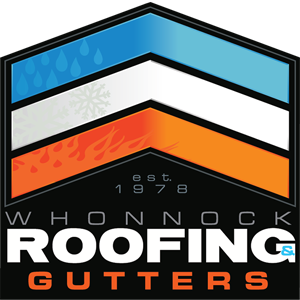 Here at Whonnock Roofing and Gutters Ltd, we can give you a free estimate/inspection on your roof to let you know if and when you need a new roof. What are Fibreglass Laminated Shingles? Fibreglass laminated shingles are a common roofing material currently used on the West Coast. These products come with a Manufacturers Warranty commonly ranging from 30 years to a limited lifetime, making them an attractive product to homeowners concerned about to the longevity of their roof. Fibreglass shingles feature a mat that is made of wet fiberglass held together with a urea-formaldehyde resin. The mat is soaked with asphalt filled with mineral fillers, which makes it waterproof. The layer of glass fibre makes fibreglass shingles absorb less moisture and be more resistant to heat, which increases their durability in warm climates. They’re also more fire-resistant than organic. Laminated or architectural shingles are thicker, making them more durable than regular asphalt shingles. We only use the Owen Corning Duration Premium Shingles as they come with the BEST warranty in the business and also come with the patented SureNail Technology. What is SBS / Torch-On? SBS (Styrene Butadiene Styrene) is a bitumen-based product modified with synthetic rubber, installed using an open-flame torch, which heats the bitumen to its melting point, allowing the membrane to be completely fused together. The standard installation method for a SBS roof system is a two-ply membrane, installed over a suitable protective barrier so as to prevent the open flame from being directed to a wooden roof deck surface. An advantage of SBS/torch-on roofing is the fact that you are installing two plys of membrane completely fused together, which results in a very durable, water-tight system that can be used in almost any kind of water-proofing needed above or below grade. How long should my new roof last? If installed correctly, a new roof should last NO LESS than 20yrs. We use the Owen Corning’s Duration Premium Shingles. They can come with a 50yr FULL guarantee from the manufacturer. We are the only company around that can offer this as we are their certified installers, for the Lower Mainland. This question is also dependent on the type of product installed and ventilation requirements. BC building code mandates that there should be one roof vent installed for every 300sq ft of insulated attic space. While there are various types of shingles in today’s market and usually, the rule of thumb is that the heavier the shingle the more protected your roof will be. However, the Owen Corning Duration Premium Shingles also come with a patented and unique fabric strip in the nailing area called “SureNail Technology”. This gives the nails exceptional grip strength and outperforms it’s competitors with wind protection of up to 130mph.